The Guardian has a good article regarding the prevalence of Round Up (glyphosate) in our food supply. As many of us have long suspected, it’s in just about everything. But the FDA hasn’t completed their study, so the only information available is the internal emails between researchers on this study. For people who think that Round up actually disappears from the soil once it’s been applied, the contamination across the entire gamut of your food should put that belief to a serious challenge. Here is an excerpt from the article, but please do go and read it as this is really only a snippet and it is well worth the read. 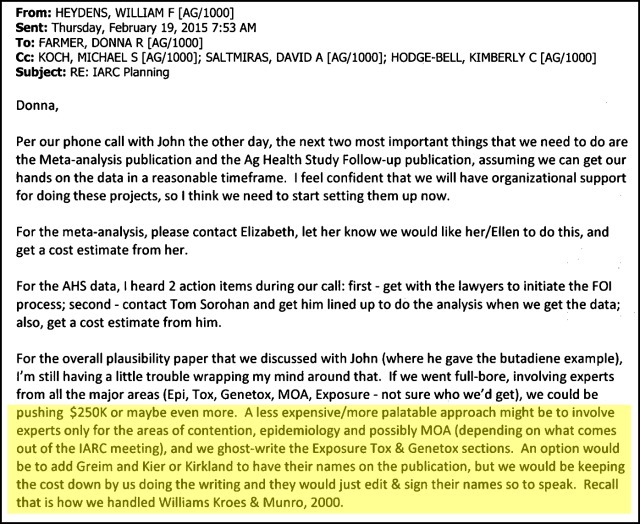 ……..But the internal documents obtained by the Guardian show the FDA has had trouble finding any food that does not carry traces of the pesticide. 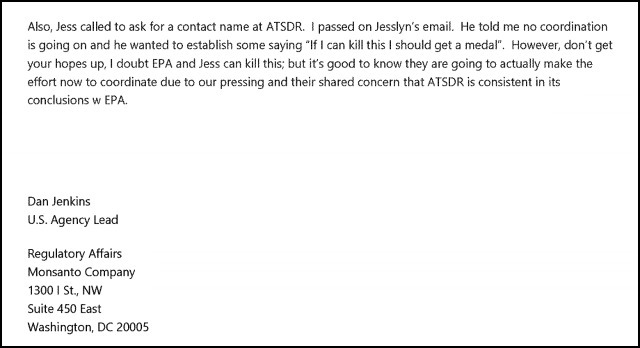 That internal FDA email, dated January 2017, is part of a string of FDA communications that detail agency efforts to ascertain how much of the popular weedkiller is showing up in American food. The tests mark the agency’s first-ever such examination. 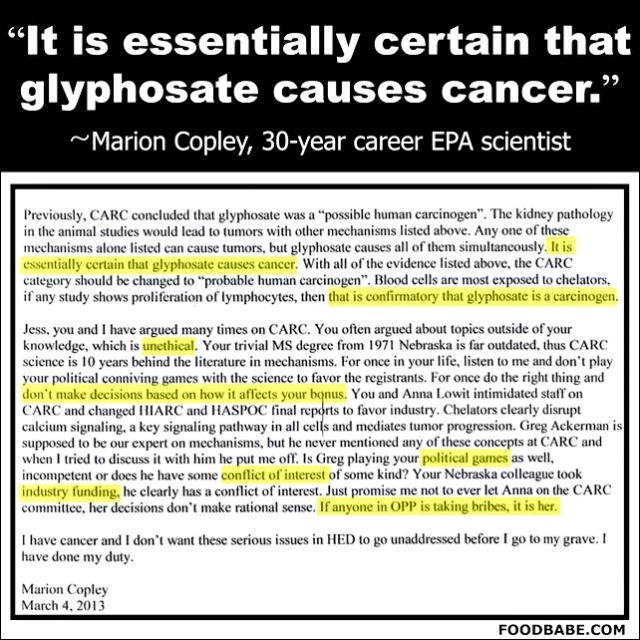 As most people who pay any attention to our food supply issues know, glyphosate is in pretty much everything. It’s in urine, breast milk and umbilical cord blood in over 90% of urban dwellers tested for presence. Over 90% of the corn and soy in this country are GMO variants…What could go wrong? 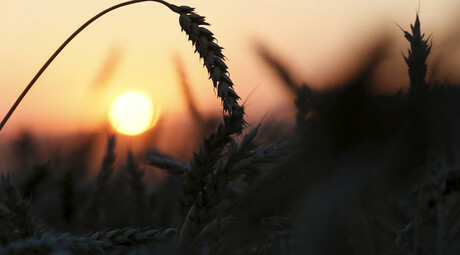 Additionally, a very likely cause of the increase in gluten intolerance is that some wheat farmers are flooding the wheat fields with glyphosate prior to harvest to cause the wheat to know it’s dying and push it’s energy into the seed quickly (increasing the weight of the yield) and to make it easier to harvest because the dead, dry plants are less likely to tangle and slow the equipment down. Not all are doing this, but some are…and it’s no good. The article below details a recent announcement that the FDA (Food Destruction Agency) is going to test four foods for the presence of glyphosate. If history is an indicator, as it usually is, the FDA results will probably be “negligible presence found”, and they will pat themselves on the back for being good controllers of the food supply. But maybe, just maybe, a few honest people will be involved and real results might be put out-officially, or unofficially. The US government’s food watchdog will soon begin testing certain products for the presence of glyphosate, the active ingredient in Monsanto’s herbicide Roundup, which the World Health Organization linked to cancer last year. Milk, corn, eggs and soybeans are on the list of foods the Food and Drug Administration (FDA) intends to test for glyphosate residue. Soy and corn are widely used in animal feed and are among the crops routinely sprayed with variants of Roundup, a herbicide developed by Monsanto in the 1970s. Glyphosate is now off-patent and widely used around the world, with Monsanto promoting “Roundup Ready” crops genetically modified for immunity to the chemical. “The agency is now considering assignments for Fiscal Year 2016 to measure glyphosate in soybeans, corn, milk, and eggs, among other potential foods,” FDA spokeswoman Lauren Sucher told Civil Eats, an American food news publication. Recent testing by private companies, universities and consumer groups has found residue from the chemical in honey, cereal, wheat flour, soy sauce, infant formula and breast milk. 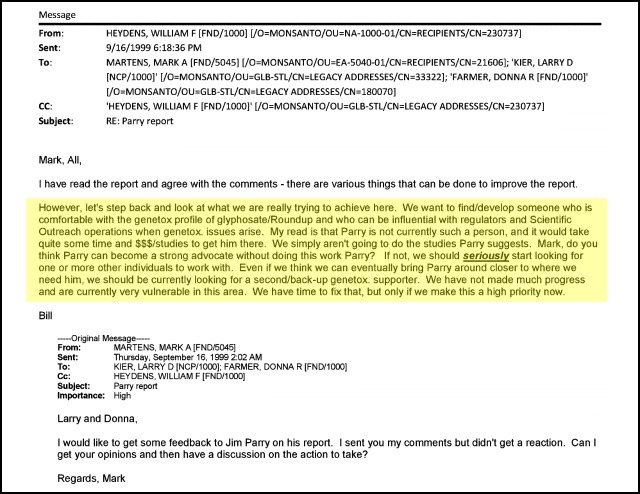 The FDA’s failure to test for glyphosate was among the things the agency was criticized for in a 2014 audit by the Government Accountability Office (GAO). 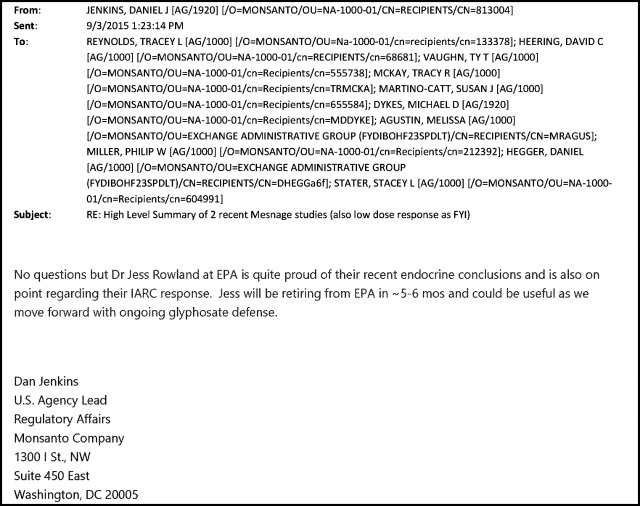 While stopping short of demanding that the FDA conduct glyphosate testing, the GAO said the agency should at the very least publicly disclose that it does not do so. “Maybe we shamed them into it,” John Neumann, a spokesman for the GAO, told Civil Eats. The FDA is facing a follow-up evaluation from GAO in June this year. A Monsanto chemist discovered the herbicidal properties of glyphosate in 1970, and the company began selling it as Roundup in 1974. 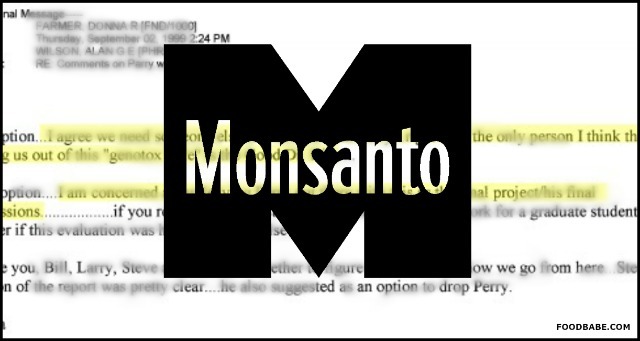 Glyphosate use became widespread in the 1990s, as Monsanto rolled out “Roundup Ready” lines of genetically modified crops, enabling farmers to spray the fields directly. The patent expired in 2000, enabling generic version of Roundup to enter the market. According to the EPA, as of 2007 glyphosate was the most used farming herbicide in the US, and the second most used in American homes and gardens. In addition to potential health hazards to humans, the widespread use of Roundup has led to the near-destruction of milkweed, a plant serving as the primary source of food for Monarch butterflies across the Midwestern US. This resulted in a 90 percent reduction in the Monarch population. Still, the judge feels it’s appropriate to dismiss the lawsuits while these horrors continue to unfold. So there you have it. The FDA is protected by secrecy, able to approve harmful drugs under a cloak of application confidentiality, knowing full well that participation in approval processes is limited. Not everyone is in on it, of course, especially those who the FDA knows would be likely take issue and dare to ask questions. What does this mean for your food and for those who advocate the humane treatment of animals? 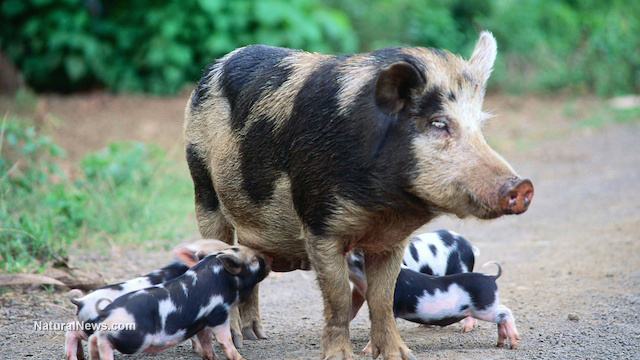 It means that animals will continue to be given drugs that severely compromise their health. They are dying, trembling and living in a constant state of fear. If this has you shaking your head in disbelief and disgust, it should. Once again, greed enters the picture – one that’s well-framed by loopholes and hush-hush regulatory processes. April 25 (Reuters) – Heavy use of the world’s most popular herbicide, Roundup, could be linked to a range of health problems and diseases, including Parkinson’s, infertility and cancers, according to a new study. New England Journal of Medicine Calls for GMO Labeling! In the August 20 issue of the New England Journal of Medicine, two respected experts on pesticides and children’s environmental health call for the FDA to require mandatory labeling of GMO foods. Currently, the FDA does not require labeling of genetically modified foods, even though 65 countries mandate the labeling of GM foods, and more than 90 percent of Americans support it. Last month, the DARK Act, which would block states and federal government from making mandatory labeling laws, passed in the House. Next, it goes to the Senate. In the article, titled “GMOs, Herbicides, and Public Health,” Dr. Philip J. Landrigan, the Dean for Global Health at Mount Sinai School of Medicine, and co-author Charles Benbrook, a crop and soil scientist, say the time has come for three important steps. The number of chemical herbicides applied to GM crops has increased sharply and is scheduled to increase even more in the next few years. The authors believe labeling will have multiple benefits. It will help track the emergence of new food allergies and better evaluate the effects of chemical herbicides applied to GM foods. And also, it will respect the wishes of the growing numbers of consumers who insist they have a right to know what is in the foods and beverages they are buying. The article also calls for the National Toxicology Program to urgently assess the nature, effects, and possible poisons in pure glyphosate, formulated glyphosate, and mixtures of glyphosate and other herbicides. Cannabis Legalization on Missouri Ballot: Two Paths from Which to Choose…Freedom, or Feudalism? Two Paths from Which to Choose…Freedom, or Feudalism? Over the course of the past few months I’ve been doing a fair amount of investigation on the issue of cannabis and various efforts to legalize the plant for the general benefit of humanity. Initially, I looked at the issue of legalizing cannabis as a simple matter of civil liberties with a massive pseudo criminal front propped up by drug court fees, seizure laws, probation and the expenses paid to the system in that, cheap prison labor and increased family court revenues due to foster care and custody issues…And yes, it also incidentally had benefits for people with serious medical issues. Honestly, I have had a complete paradigm shift. Complete. Not that the prison industry complex and costs to society associated with those issues are irrelevant, but there is a much larger, and much more evil truth about the control of cannabis that absolutely must become common knowledge. It’s particularly important that those who largely identify with conservative and Christian principles, or strong Constitutionalist ideologies become fully aware of the collusion between government and corporations to remove a beneficial plant from our access. Cannabis actually heals. And it restores life to people who are very ill. Hundreds of studies show this to be true, and also that cannabis is tremendously beneficial for our overall health. The reason this has come to the forefront for many of us is that it is becoming increasingly difficult to hold to the idea that “Reefer Madness” has any basis in fact. It simply isn’t factual. Sometimes there are people that use cannabis that are just literally criminals and have no regard for their fellow man. These same criminals may also consume carrots, but the carrots are not the cause of their deficient characters. With or without cannabis, these people would be violent. Cannabis does not cause crime. Violent cartels exist because of cannabis being illegal. So in effect, the only violence that can truly be attributed to cannabis is state sanctioned violence through unjust laws. Simply put, the controls on this plant are the reason for violence associated with the plant or it’s distribution. The tipping point on the truth around cannabis being put into the status of a Schedule One controlled substance (the Schedule One designation means it has NO medicinal value) has been achieved among the people. For those who have some qualms about whether or not this plant needs to be flatly legalized, please watch this video about Rick Simpson oil. This man has given people -as in freely given- cannabis oil, and they have been cured of all manners of disease including multiple types of cancer and terminal cancer. If you watch that video and still have any uncertainty left in you, watch this video, and forgive the one instance of yelling at the very beginning. The facts are that corporate interests paid to have cannabis categorized as a Schedule One controlled substance. Corporate interests, violent cartels, the prison industry and tyrannical seizure laws fattening the wallets of a few, have been the only beneficiaries of cannabis control. Multitudes of people have died from being denied the best thing on earth to beat cancer. And the people in the corporations, the politicians that continue to be bought off from taking right action, and the pharmaceutical companies, are complicit in their deaths. Yes, I said complicit. The facts are in. Cannabis prohibition must end and will end very soon. Just look at this list of the plethora of studies that show the benefits of cannabis in treating human ailments. There are hundreds of studies on the effectiveness of cannabis, not just in treating symptoms of disease, but actually curing the disease in many instances. It can’t be covered up any longer. However, we do have some questions that we need to answer for ourselves as we move forward on cannabis. The first question is whether or not we are happy with the current state of controlled and declining health and access to alternative/natural treatments? Currently, the FDA -who took 30 years to admit that vitamin C is helpful in thwarting the common cold- is in control of our food and our medicine. On average, FDA approved medications kill 100,000 people per year. 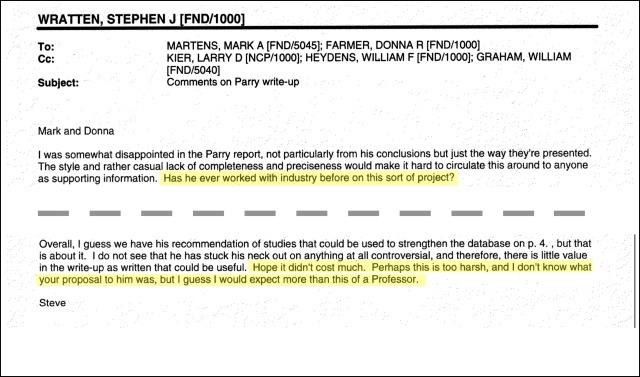 Those are their own reports on the FDA’s website. The FDA has stated they are justified in exercising authority to control what we consume because the Almighty gave commands on dietary laws in Scripture. They think they have as much authority as the Creator of the Universe. Seriously. Check it out here. (page 26 of 30)The FDA also holds the position that “raw milk is inherently dangerous and should never be consumed by any one for any reason.” Never mind the fact that if that were a true statement, there would never have been a second generation of human beings. Honestly, I could go on for a full-length book about the criminal behavior of the FDA in relation to our food and medicines, but I’ll restrain myself. Just watch network tv for one night, count up the recalls and suits being advertised along with all the new medications you should talk to your doctor about, then ask yourself if you think they are doing work that is truly beneficial for humanity. If you can truthfully say that you are pleased with the quality of our nutrition, not knowing whether or not you are consuming genetically modified organisms, and the health care system in this country, then you need do nothing. If you are not satisfied with the status quo of chronic pain, disease and debilitation, and lack of personal control, then it’s time to do things differently. The next series of questions we must answer is what kind of business model “We the People” want to follow as we end prohibition on this plant? Do we want to stick with the controlled access, medical industrial cartel dialectic, where production, distribution, and access are licensed and heavily regulated, and keep fascism growing? Or do we want to seek free market enterprise and let everyone who is interested put their own money on the line and succeed or fail on their own merits? Have layers of bureaucrats proven themselves to be beneficial to our literal wellbeing? Do we think we personally should have the ability and choice to make decisions about what we consume? Or do we believe the bureaucrats, paper pushers and corporations have proven themselves to have a legitimate and beneficial hand in securing our health? Once we’ve answered these questions to our satisfaction, then we must decide how we move forward on the issue of cannabis legalization and access. In Missouri, we will have two very different initiatives on the ballot in 2016 for a proposed Constitutional amendment. Since I’m from the Show Me state, and these two initiatives are responsible for bringing me to the paradigm shift I mentioned above, I bring you “The Tale of Two Initiatives”. One is very short and flatly legalizes it. The other is 4 pages of small print and proposes to regulate cannabis within the Constitution of the state. From that short overview, it is very likely that those who know me have already determined which initiative has won my support. But it’s necessary for everyone to make up their own minds about this, so the remainder of this rather lengthy article is going to focus on the nuts and bolts of these two initiatives. Other states have similar proposals in position. Let’s deal with the short one first. This initiative, identified as 2016-013, was written by Mark Pedersen formerly of the Kansas City NORML group. Even many major proponents of legalizing cannabis have said it was too radical. Notably, the national level of the KC group that worked with Pedersen, NORML (the National Organization for Reform of Marijuana Laws) is reported to be the biggest opponent of this initiative. We’ll have to deal with the reasons behind NORML opposing this amendment in a subsequent article. For now, we’ll just look at the “radical” amendment first and talk about possible pros and cons related to it. 2016-013 is currently being circulated for the collection of signatures to get onto the 2016 November ballot. It proposes to remove cannabis from the controlled substances list. It doesn’t place limits on the amount one person may possess or grow. It also doesn’t have any age limits set within the confines of the proposed amendment to the Constitution. It secures the right of people to grow enough for their personal use and prevents extra regulatory controls on farmers and processors of all cannabis products, including all strains, cannabis sativa, cannabis indica, cannabis ruderalis, and crosses of these cannabis strains. It prohibits the mere presence of cannabis and cannabis products from serving as cause to charge with impaired driving. And I do admit that it does indeed seem radical on its face. But let’s examine the issues so we can make determinations with solid information. First up, let’s look at the “radical” idea of not limiting the amount that an individual may grow. This is terrifically important. If you watched the Rick Simpson “Run From the Cure” video I linked earlier, you are aware that a single full treatment for cancer or serious health issues requires a pound of cannabis. The oil from the plant is extracted and a pound will render about 2 ounces of oil. It’s a lot of cannabis. What’s more, if a person has received chemo or radiation, they will need at least 2 full protocols of the cannabis oil to fully heal. It can take a lot of plants to get those amounts of cannabis. The street value of a single treatment amount bought by the ounce is about $4800.00 right now. If you can get the entire pound and buy it all at once you might be able to get a discount and get it as low as $3400. Is that too high of a price to cure cancer? Certainly not, but what if you don’t have $3400 to $4800? Does your ability to pay for a treatment make you worthy of having it? Conversely, does the inability to pay make you a less valuable human being? If there aren’t limits placed on the number of plants one may have, it opens the door for people to be better able to heal themselves and to take personal responsibility for their own well being. Next let’s look at the thing that really struck me personally about the 2016-013 initiative. There is no age limit set forth for possessing or using cannabis. I thought that was pretty over the top, and I told the people who contacted me about the initiative that it was my opinion that it needed an age limit. They made some pretty good arguments against it. One of those arguments was very basic from a freedom advocate’s point of view. The age of majority isn’t stipulated in the Bill of Rights. Also, it isn’t a static thing. It is 21 for some things and 18 for other things and it isn’t something that should be ensconced in our Constitution to secure a right. Even more importantly, in light of the healing potential of cannabis oil, would anyone with any compassion in them want to prohibit a parent faced with a seriously ill child from being able to help that child? I wouldn’t. It would be unconscionable to put anyone in that position, and instead run them through a bureaucratic and medical industrial complex maze to do what every parent must do to be right in the eyes of their Creator and provide for the child help in a time of trouble. Also, it is emphatically evident that parents have a duty to protect their children from ingesting things that they shouldn’t be ingesting. If you are going to have cannabis in the house, you have to be responsible and not allow your children to use it on their own. In other words, BE A PARENT! Next let’s take an actual look at the issue of THC in the system and driving under the influence. THC being present in the system is simply not at all equal to impairment. Yes, THC is the psychoactive chemical in cannabis, but its presence within a person’s system doesn’t mean that the person is impaired. It isn’t like blood alcohol content, in that a person could have high levels of THC in their system, but still not be impaired. If someone is using cannabis to treat themselves for health reasons, THC will be high, but they are not likely to be impaired if they have been following a protocol for any length of time at all. There is a lot of science behind this fact, and it is important to look at the science and make logical decisions about THC as opposed to emotional decisions predicated on a faulty basis. In no way shape or form am I saying that you cannot be impaired by cannabis consumption. You certainly can be impaired. That impairment would be evident in a motor skills test that was video taped and witnessed by at least two witnesses. Whether people like it or not, that would be evidence of impairment, but THC levels are not a credible assessment of impairment. A study using coordination testing showed inevitable failure on field sobriety testing if blood THC levels were 25 to 30 ng/ml. But, many failed testing at 90 and 150 minutes after smoking even though plasma concentrations were rather low. The researchers had the foresight to conclude that “establishing a clear relation between THC plasma concentrations and clinical impairment will be much more difficult than for alcohol”. This is because alcohol and THC are chemically different and are metabolized differently inside the body. Now we are ready to take a look at the “Show Me Cannabis” (aka Mo NORML) initiative proposition. First off, this initiative, 2016-009, isn’t being circulated for signatures yet because the proponents of the initiative have reportedly “gone back to the drawing board”. However, it is available from the Missouri Secretary of State’s office at this link. I have put in a couple of emails asking for a conversation with the gentleman heading up this initiative and have received no replies, so I cannot relate any responses to questions I have regarding this initiative. In the first sentence, this initiative is providing for regulatory control of cannabis to Missourians over the age of 21. It stipulates that regulations are to be promulgated for many purposes. Here are a few of those. Promulgate regulations to allow for state licensed producers, retailers, and distributors of cannabis. It states that revenue generated by cannabis will be used to fund police and firefighter pensions and retirement plans as well as elementary and secondary schools. That the revenue will be used to prevent: the establishment of cartels, under age 21 use, and to prevent advertising cannabis to those under the age of 21. It allows for households to grow up to six plants, have up to 16 ounces of dried cannabis, or 20 ounces of liquid cannabis. It proposes to expunge nonviolent cannabis convictions. Also to require a person to get a license to purchase, sell, manufacture, deliver or process cannabis. It requires the labeling of the THC content on all cannabis products, and provides for limitation on the level of THC allowed in cannabis that may be sold. It provides for a 25% excise tax on the first “fair market sale” of all marijuana….And more. Lots more, actually. Let’s start with the 25% excise tax on the first “fair market sale” of any cannabis. Well, right there we have a problem. “Fair market sale” is defined in this proposed amendment as “means with respect to the sale of a product, a sale in which the purchase price of the product is not less than the price that a willing seller would accept and a willing buyer would pay in the open market and in competition with other similar products.” Hmmm. If this is absolutely constrained to the FINAL sale of the product to the consumer of the product, that means that if you are buying from a “licensed retail establishment” that you will be paying approximately 33% in taxes to the State. (The 25% excise and the 8% sales tax) It doesn’t state that it is on the final sale though. It says it is on the “first sale in an open market”. So…does that mean when the grower sells to someone for either distribution or manufacturing that the grower has to collect the 25% for the state? Here is the definition of an excise tax. (It’s rather complex, and this article is already very long, so please read the link) It certainly sounds to me as though the tax is something that is supposed to be collected on the sale by the grower after he pays the license fee to be able to sell the product at all. He must then increase the down line cost of the product by adding an additional 25% cost to the next in line. Then when you get to the retail portion, the cost of goods is further increased by the state sales tax. So, let’s say the licensed grower sells an ounce for $100 for his labor and upkeep, and has to collect $125 from the licensed wholesaler/distributor or manufacturer to whom he sells. The distributor or wholesaler then has to mark up the product by whatever percentage will allow him to pay his license fee and make a living wage to the retailer, who then must again mark up what he sells the product for in order to cover his own living wage. Presume you do typical mark up of 30% for the distributor/wholesaler (more for the manufacturer as there are additional processes involved) as the distributor/wholesaler is supposed to be moving volumes. Now you’re looking at $125 + $37.50= $162.50. Then the retailer usually has to double as they have more insurance liability by having people come in and out of their location, and they have to deal with displays and such. Now you’re looking at $325 per ounce before the typical 8% sales tax ,which is another $26, so the cannabis consumer pays $351 per ounce and the state makes $51 plus licensing fees every step of the way. Mind you, $100 an ounce as a starting price is terrifically low. But is this really going to help out the average person a whole lot? I’m all for the State making money on the retail, but my rule of thumb is what did Yahweh ask for a tithe? Only 10%. Why does the State deserve more than 2 and half times what He requests? Maybe I’m the only one who thinks this way…I kind of doubt it though. Someone will say, “But you can grow up to six plants, and that surely is enough for a household!” Well, let’s look at the six plant limit. Below you’ll find a little scenario that is not at all unreasonable. Just ask anyone who has ever gardened. So you decide you like to garden and you’ll grow your own cannabis and therefore bring down the cost of making cannabis available for your household. You order seeds and spend $90 for ten seeds. Really. That’s a pretty good price, too. So you very carefully germinate your seeds and 9 out of ten germinate. Now you have to throw three down the toilet or you’ll be over your six plant limit. You carefully place these in small pots. They begin to put on leaves and now you have your six plants! You’re all legal and looking forward to excellent yields…Then you come home from work and two of your seedlings wilted on you. You mist them and hope they’ll recover. Well, they don’t. So now you have four plants and no more seeds to germinate. You figure that’s all fine because the advertisement said this was a high yielding variety and you can only have 16 ounces of dried product anyway. So when they get to be about 15 inches tall you put them outside into the best area of your backyard for good sun, but not too much, and you check on them daily. You patiently wait for September when you should be able to harvest. In the end of June, you and your family go away for the weekend and when you come home, one of your plants has simply disappeared. And the Japanese beetles picked that weekend to hatch out and eat your remaining plants up like crazy. So you set about making a protective enclosure for them and that involves shade cloth and posts and a gate and it takes you the rest of the week to get that done. You only have a couple of hours to work on it every night because this endeavor isn’t one that actually pays the bills. At this point you’re thinking it’s probably a lot easier to just buy the stuff, but you’re stubborn and keep after it until September. They’re looking okay, but the yields in the advertisement don’t look attainable…Harvest time comes and you get a total of three ounces from your three plants. Probably because the Japanese beetles hit right at flowering time…So you have three ounces after 6 months of tending and you’re scratching your head to figure out if it’s even worth trying again. Imagine going through that when you are ever so hopeful that you will get a good yield on a strain that will help your child with epilepsy, or a parent with debilitating arthritis, diabetes, or cancer. Six plants? At what stage of maturity? And what happens if you are over that level and get caught by Code Enforcers or the police? Well, we can’t answer that other than to say the legislature will authorize fines and penalties for going over the “Household Exemption” level. It does limit it to up to $1000 or a year in jail. Does that sound good? Does it count toward the retirement funds and school funds prescribed in this amendment proposal? The proposed amendment says “revenue”. Do the enforcement fines and penalties count toward revenue? Let’s consider the issue of using the amendment to aid law enforcement and firefighters pensions and retirements, and helping out the public school system with additional funds. While I am pro-education and pro-firefighter and all for peace officers, don’t we already spend a fair amount of tax money on these things? Are these funds being managed well? Isn’t this what various lottery proceeds are supposed to enhance as well? If we throw more money at them, do the actual students and the actual public servants ever really benefit? With the seizure laws that have been so onerously used, I have a really hard time thinking the public needs to give more money to police so that they can get more money by citing more people for regulatory violations as promoted in this proposed amendment. There are some good things that are done in this proposed amendment. One is expunging of nonviolent cannabis offenses. But when you compare these two initiatives that, on their face, are supposed to legalize cannabis in Missouri, one flatly does so, and the other creates a plethora of bureaucracies and potential regulatory abuses along with continued legal system fines and penalties. Let me be very clear here, while there is no part of me that wants to tolerate minors “getting stoned” or people driving while impaired, it is apparent that the ability to control those things still exist within our legal construct. Minors do NOT have the same rights as adults. Nor do they have the same responsibilities. People who drive while they are chemically/physically impaired by cannabis to the point that they cannot properly react to the hazards on the road are not being responsible, and should be charged with driving under the influence. Video evidence should be sufficient for the enforcement of driving while impaired. Please check out all the links I posted in this incredibly long article. It’s very important that when we have amendments to consider on the ballot that we are wise in our decisions about them. We cannot be reactive and responsible at the same time. Study it out and be certain of your decisions. I encourage you to read these amendments again, and if you have concerns, please feel free to voice them and let’s see if we the people can positively, and responsibly, disentangle ourselves from the corporately controlled nanny state on this issue.